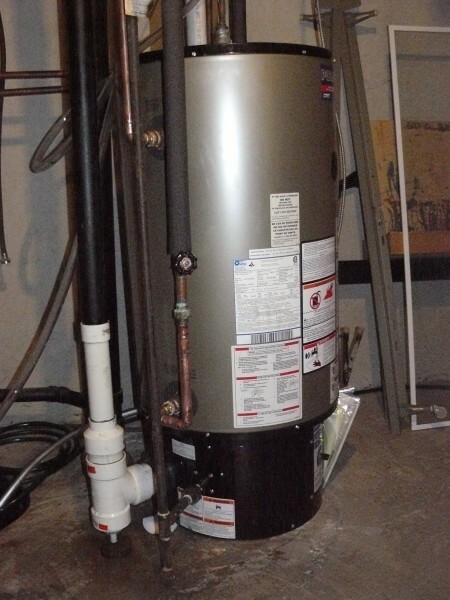 Our 34G Polaris water heater was replaced not to long ago. Wow, over 7 years with the tank, more than half of those years with numerous problems and finally Direct Energy decides to replace the tank. Although, that’s about 10 years sooner than most Polaris water heaters should be replaced. 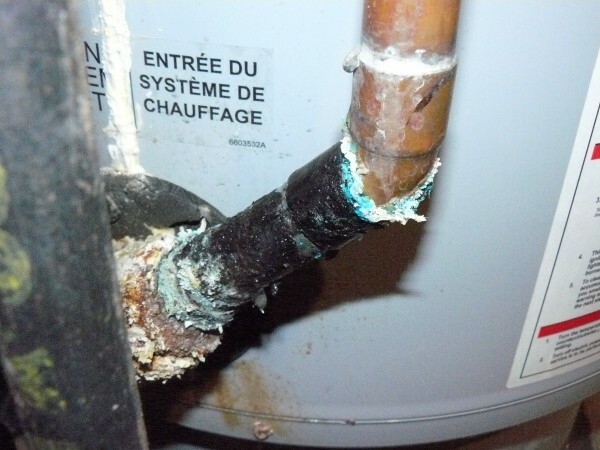 For some reason (still unknown to me) the water heater was deemed un-repairable by Direct Energy. My only guess is that potentially replacing the blower motor assembly for the second time in 7 years might have put the total parts cost over their break even threshold? Unfortunately, this water heater replacement wasn’t without drama. It started with the old tank tossing an Error Code 1 one Saturday in September. So I called Direct Energy and even though they claim “Same Day Service”, the earliest they could come was Sunday and of course, since the service Technicians don’t carry parts in their vans anymore, he had to order the replacement pressure switch (which I had told them about when I called on Saturday suggesting that the technician bring one). One of the fittings on the old Polaris water heater that was badly corroded and leaking. This one is also immediately above the natural gas inlet. Now, this first technician also noted that we had severe galvanic corrosion on the Polaris water heater fittings and he also scheduled for a crew to come out on Monday to repair that. Great! I’ve been complaining about that to every technician since we moved into the house! Monday is where things started to go “funny”. A second technician showed up Monday morning and tried to install the new pressure switch we had received but it didn’t fix the issue. Now, I say tried because the pressure switch wasn’t actually the correct one for the model of Polaris water heater I had. The technician was confused by this but after testing the whole system, he noted that the blower wasn’t pushing nearly enough air so even with the correct pressure switch, it wouldn’t have mattered. That’s when he ordered the new blower assembly. So then I was waiting for the second crew to come Monday afternoon and replace the fittings on the tank. Well, they showed up just after 1PM. With a new tank. Huh? On top of that, they didn’t have any fittings to replace the heavily corroded ones on the existing tank. WTF? I called Direct Energy before they even brought the new tank in the house because I didn’t understand what was going on. After talking to a person in the Rental Water Heater group, I was basically told that the tank replacement was my only option because they weren’t going to repair the existing tank. Uh, ok? Alarms bells are starting to ring here but my brain couldn’t process everything fast enough to realize I was about to get screwed. The installation crew with the tank inform me that I need to pay for a venting upgrade due to the code changes and they give me the total cost ~$250. Yikes. Well. But then I’ll have a new tank and hopefully no issues? Oh, and they have only managed to scrounge up two fittings so they will use those and the “best” two of the existing ones but will reschedule to come back to replace those two later. Uh, ok. let’s do it. 7+ hours later at ~8:30PM when they finally finish the replacement (that’s not an unreasonable length of time for a Polaris dual outlet system) they present me with the work order that I need to sign agreeing to pay the ~$250 venting cost. I notice that the form is a rental agreement but the installers are pretty certain I only need to sign where the venting cost is recorded and not the actual agreement. Alarm bells again but the tank is already installed and I’m not sure what else to do so I sign in the materials costs section and not the rental agreement section, just like the installer indicated. This is the newly installed 34G Polaris water heater with all new venting. 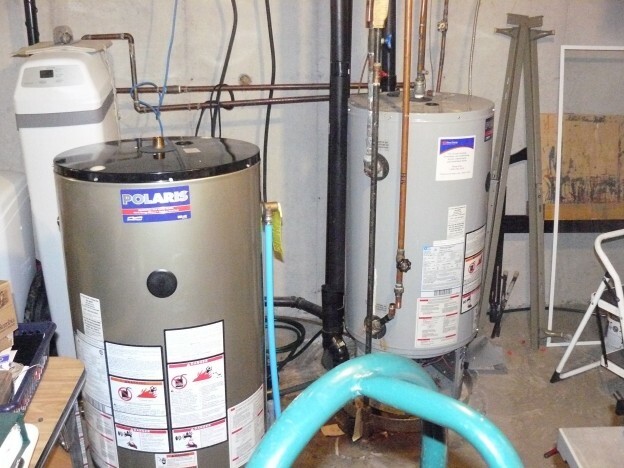 You can continue reading Polaris Water Heater Replacement – Part 2. This entry was posted in General and tagged Direct Energy, gas hot water, hot water, Ontario, polaris, repair, water heater on 2013/02/25 by Jeff Ivany.